Catching up on some E3 news, last week EA Sports put up - then removed - a page depicting Chicago Blackhawk Jonathan Toews in a definite cover art pose. Operation Sports snagged that screengrab before it was taken down. 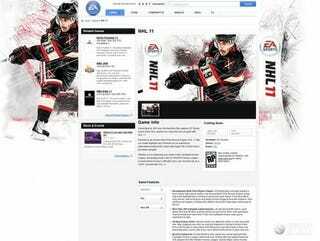 Though EA normally waits until a little further in the offseason to announce its cover subject, this is around the time the winter sports get their box art reveals. Toews, the Hawks' captain, joins teammate Patrick Kane as EA's NHL coverboys. Kane graced NHL 10's cover. Toews is seen here in Chicago's throwback sweater.